During the first half of the 20th century is was quite common to see a distance coach working with throwers, or vice versa. Without a big staff of assistant coaches, collegiate track coaches were required to have a much broader skill set. Just look at the biography of the legendary Bill Bowerman as an example. In Seattle Ken Foreman did the same thing while across town Hec Edmundson not only coached the University of Washington track team (including several Olympic medalists in various events), but also guided the basketball team for nearly 30 years. As training has become more specialized, this legacy has been replaced with one-event specialists like myself. But coach Dan Pfaff is proof that this rare breed still exists. Pfaff has had unprecedented success across nearly every event including the sprints (1996 Olympic 100-meter gold medalist and former world-record-holder Donovan Bailey), jumps (2012 Olympic long jump champion Greg Rutherford), vaulting (2007 World Champion and US record holder Brad Walker), and throws (US discus record holder Suzy Powell). Throughout his career he has coached at major universities like LSU, Texas and Florida. 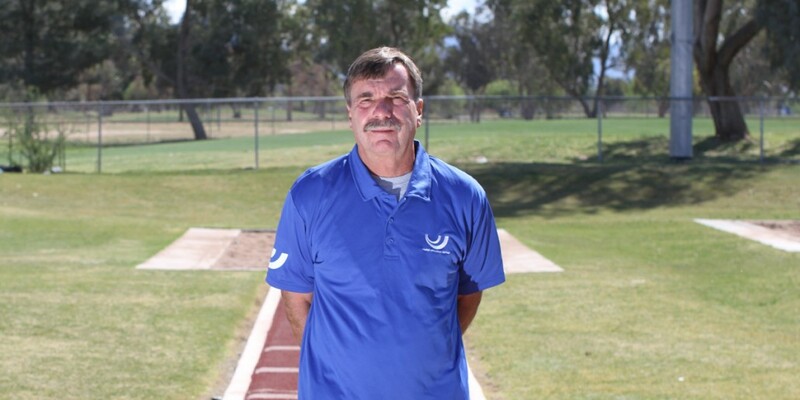 More recently he has spent time leading the USOC Olympic Training Center in Chula Vista and the UK Athletics High Performance Centre in London. After the London Olympics he took on a new role as coach for the World Athletics Center in Phoenix where he will work with Walker and many other world class field event athletes. A few weeks ago I had the chance to pick Pfaff’s brain about a variety of topics including how to improve technique in older athletes, common themes in his approaches to the different events, the use of different intensities in training, and his experience and thoughts on the hammer throw. Due to the length of the talk I will be posting it in three parts. Below is the first part which covers technical learning and the common themes between all events. Martin: I’d like to start off with a question that’s more personal in nature. I’m curious to hear your approach to fixing the technical problems of someone with very engrained bad habits. In other words, how do you teach an old dog like myself new tricks? Dan: I think there are two directions from which you can attack problems. If you are looking at film you can look at frames that occur before the problem and frames that occur after. Sometimes working on things further down the road can go back and fix the cause. And sometimes the art is looking at how many frames earlier do you have to intervene to get an effectual change at a certain point in time. A lot of times, especially in the throws, the resistance to change is an alarm theory. We set alarms like single support, double support, ball position, time in the air, and so on and so forth. We set up this alarm system for executing movements. These alarms are pretty dominant for elite athletes and override spatial and temporal awareness. Once you are set in a certain pattern the alarms are the central governor so to speak. Martin: I know you generally prefer focusing on the movement in its entirety. But when trying to focus on these alarms will you break down the technique into its component parts? Dan: I am pretty much a whole movement guy. Drills and part-whole learning have their place as you evolve as an athlete from a beginner to an elite athlete. But I haven’t had much success with drills or isolated part-whole integration with advanced athletes. We use real-time tasks. Martin: So it sounds like to alter the alarms you simply want to make things feel different for the body so that it can relearn things. What inputs do you use to change the alarms? Dan: We may change positioning in the circle, the weight of implement, or other entities. But we are always working in real-time with the whole movement. If some of the alarms are stuck on the entry of a throw, you can play with shoulder axis, hip axis, deflection angles, where is the head during the wind, etc. There are certain triggers that start the alarm process. Part of the art is figuring where the triggers are that set or reset the alarms. Thanks Martin and Dan! Many commonalities indeed – and some that get overlooked. For example, the javelin is much more related to high jump and triple jump than shot, discus or especially the hammer yet few see it that way. And the recent fad of associating javelin with the other overhand running throw, the cricket bowl, has caused a lot of harm. So…. yes, look for commonalities but make darn sure you look closely enough, and do a complete job of understanding the differences. I know, we’re not talking about the javelin here, but it gets lumped is as part of “the throws” so often and with such disastrous results that I can’t help but speaking up. When I was training in the 70’s and 80’s, there were many high-level coaches I was exposed to who were highly respected, successful coaches who simply didn’t get it about the javelin yet they guessed anyway. This was a mistake. Javelin can certainly be learned, you don’t have to have thrown it to get it (although it really helps), but typically, unless the coach has had lots of exposure to many high-level javelin learning environments, it’s going to be bad. I’m sorry to say the published literature is insufficient (incomplete or badly inaccurate) to learn enough from without real-world experience. The range of styles and capabilities of the athletes keeps even the specialists busy. No, I don’t have all the answers either, but I do realize that the javelin seems to be a challenge for most coaches. Look at the multieventers.. Thanks for listening to my pet peeve! Thanks for the comment Duncan. When I talk about commonalities I mean more about the commonality in the approach and I belive Dan is the same based on what we talked about. The template is indeed the same: identify priorities based on what needs to be accomplished in each event and then use that to create a plan. The way you get to the priorities and what you do with thim is where the commonalities are, but there are some stark difference in what the list of priorities looks like for each event. Experience is definitely needed and that comes to making the list of priorities. With experience you learn what is needed to be good in the event and what is needed for that athlete to be good at the event. For example what they need to work on both physically and technically in order to succeed. You can read about that stuff in a book, but as you say it is hard to replicate actual experience here. I fully agree w/ Duncan. Years ago, when I was Development Chair for USATF in javelin I asked at one of our High Performance meetings if the javelin throwers could go to camps (we actually funded them back then!) with the vaulters or long/triple jumpers, as javelin was a runway/running event and had way more in common with those events than the ring throws. You’d have thought I’d grown a 2nd head and green scales, given the response from most other chairs, especially the shot & disc chairs (hammer chair was not attending). Runup rhythm, hitting check marks maximal horizontal speed at takeoff/impact have nothing in common with shot, hammer or discus, yet the javelin throwers were forced into the throws group for camps or simply would not get funding to any training camps to work in a group. How can something so simple and based on common sense be so roundly repressed?